Home › Just life › “Dixie.” Really? 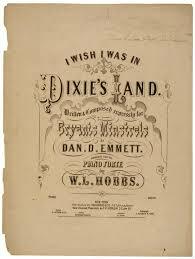 Checking for the year of the song “Dixie,” I came upon the remarkable fact that the original conceit of this minstrel song was that a freed slave is pining for the land of his birth and servitude. Huh? I always assumed it was a transplanted white Southerner. Yes, nostalgia is powerful, but still . . . Hear Fort Moultrie’s cannon rattle! Despite the hard-to-fathom sense of the original (Did buckwheat cakes and ‘Injun batter’ really make fat slaves? ), one can see why the Union song never made it to the big time, and why Abraham Lincoln made a point of having the original “Dixie” sung by is army band as soon as the war was over. It’s a great song, greater than its benighted conceit.